Established in 2011, Rovotics is a leading manufacturer of ROVs (Remotely Operated Vehicles) for subsea inspections and surveys. We also provide subsea components including GNSS receivers for ROVs and CP equipment. Our state-of-the-art robust ROV systems and advanced software maximise efficiency and minimise downtime, and have been successfully deployed for a wide variety of applications, including oil & gas, geological surveying and maritime construction. A technical training course is included as part of our comprehensive after sales support, and we offer free replacement Rovotics parts for the first year, if required. 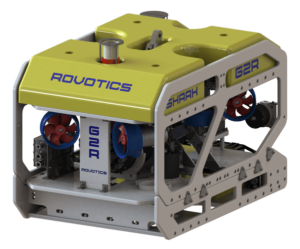 The Shark G2R ROV features a high-power-to size ratio, with over 80kg of bollard pull while fielding a 35kg payload. With a strong aluminium and polypropylene construction, it is rated for operation at up to 500m, with an optional upgrade extending this to 1000m. The Shark G3R ROV features a high-power-to size ratio, with 130kg of bollard pull while fielding a 100kg payload. 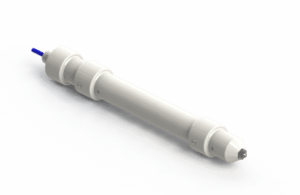 With a strong aluminium and polypropylene construction, it is rated for operation at up to 500m, with a series of optional upgrades extending this to 1000m, 2000m or 3000m. The ROV is powered by six high-reliability SPE-250 thrusters (four lateral, two vertical), incorporating unique Statorshield technology that allows the thrusters to continue operation even in the event of shaft seal failure. The Shark G3R can be equipped with two heavy-duty 5-function manipulators, or a survey skid for remote pipeline inspection applications. A wide variety of sensors and payloads can be fielded on the ROV, including bathymeters, Doppler Velocity Logs (DVL), Ultra-Short BaseLine (USBL) acoustic positioning systems, and pipeline trackers. A pan/ tilt unit, with 1-degree position accuracy, can be fitted with up to two lights and two cameras. 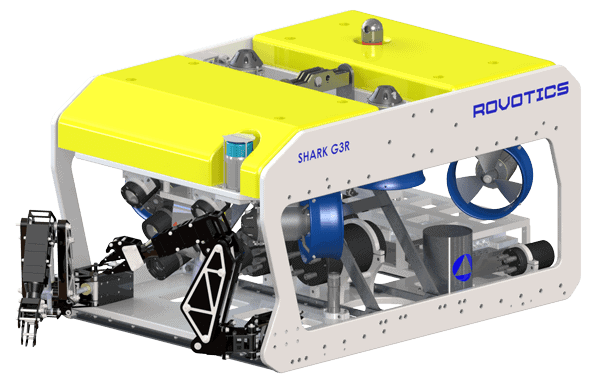 The Shark G4R is our largest and most versatile ROV, providing 244kg of bollard pull while fielding a 280kg payload. With a strong aluminium and polypropylene construction, it is rated for operation at up to 500m, with a series of optional upgrades extending this to 1000m, 2000m or 3000m. The ROV is powered by seven high-reliability SPE-250 thrusters (four lateral, three vertical), incorporating unique Statorshield technology that allows the thruster to continue operation even in the event of shaft seal failure. The Shark G4R can be equipped with a 7-function and a 5-function manipulator, and tools for a range of operations including cutting, jetting, dredging and cleaning. A wide variety of sensors and payloads can be fielded on the ROV, including bathymeters, Doppler Velocity Logs (DVL), Ultra-Short BaseLine (USBL) acoustic positioning systems, and pipeline trackers. 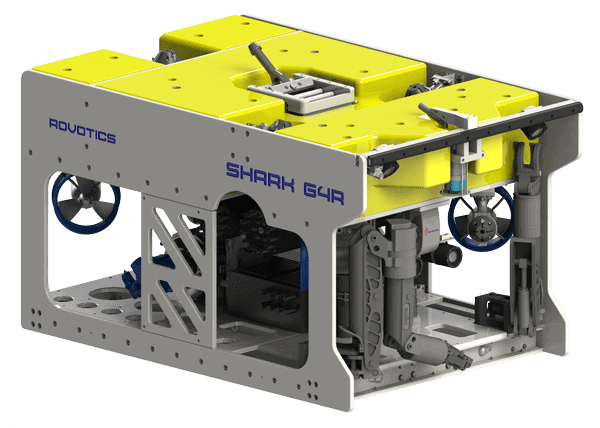 We can provide customized skids for the Shark G4R ROV as per customer requirements. 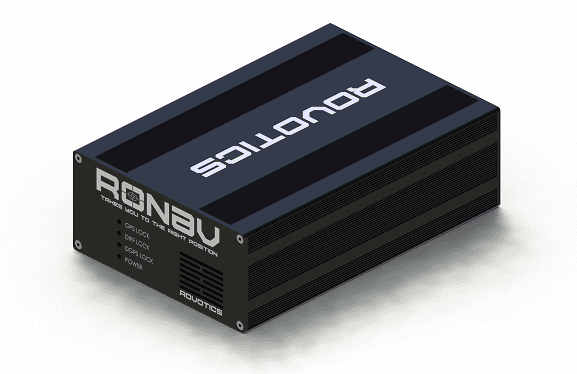 Rovotics provides a range of robust equipment for contact, proximity and trailing-wire cathodic protection (CP) inspection. Our probes and electronic pods are light enough to be mounted on smaller ROVs for remote surveying work, providing low-noise data back to the surface for easy underwater inspection. By submitting this form, you consent for your details to be sent to Rovotics and its authorized partners in order to respond to your inquiry. Depending on the location of the organization, your personal information may be transferred and processed outside of the European Economic Area.